Along with the modernization, the advancement and evolvement in the construction field have shed light on how rapid the world scenario is nowadays. Construction of an artificial island over the ocean is one of the most significant development, combining both human intelligence and technology. Generally, artificial island is made by using the land reclamation process, where rocks or cement were used to fill the targeted area, acting as a new base for the island. This article will discuss the significance of constructing artificial islands onto the ocean with respect to the ethical point of views and concerns. Global power consumption increased by 30% in the last decade. As a result, demand for an energy source to meet the power consumption escalates. Building artificial islands as a powered hub or an oil drilling plant can be a solution to this problem. Artificial Island can accommodate the facilities and equipment for the power hub or the drilling plant. This is proven by the development of THUMS islands as an oil drilling facility by Exxon, Texaco, Mobil, Union Oil, and Shell. Also by the future development of artificial island at Dogger Bank in the North Sea planned by a Dutch power grid that acts as a powered hub for offshore wind farms supplying electricity to the United Kingdom and the Netherlands. This evidence shows that artificial island could solve energy deficiency problem. This artificial island development benefits the community, companies, and governments. People have electricity for daily usage improving their quality of life. Companies gain profits and investors by commercializing artificial island. Governments gain tax money from the companies improving the economy. In terms of utilitarianism theory where the action is judged by its consequence as a moral judgment, building artificial island brings benefit to the people. The island’s purpose is to supply electricity and oil to serve people’s needs, which means that artificial island can be seen to be a sound judgment based on utilitarianism theory. Kiribati is a small nation that stands just a few metres above the sea level in the Pacific sea is going underwater. According to The Australian Bureau of Meteorology’s National Tidal Centre, the sea level rises for Kiribati has increased by 7.3 millimeters annually since 1992 and it is possible to be disappeared within the century. Rising sea level is threatening Kiribati nation’s existence on the world map for past few decades. Besides, this issue is frightening the inhabitant as well. Where will they go? Where will their next home? 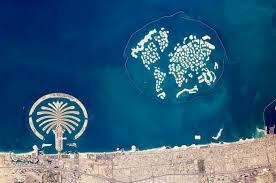 Palm Jumeirah and The World artificial island. Consideration of building artificial islands for Kiribati’s population perhaps the best option to save the nation’s future. The Japanese Engineering Firm Shimizu has designed a floating-island concept considered as ‘New Home’ for the nation of Kiribati, and the cost is approximately $450 billion. The question is can artificial island save the livelihoods of the people of Kiribati and the country? Transition over 100,000 people to an artificial island is considered as a viable solution to encounter the problem that not only Kiribati but to all other low-lying atoll islands worldwide are facing. Huge support by both the financiers and the inhabitants are crucial on building the new home into success. Producing new home for Kiribati fulfills the utilitarian principle where enabling survival for the population with a better living and save the country. Following the ethical egoistic approach, the development of artificial islands is part of a county’s pursuit for self-interest, which coincidentally benefited the society as the by-product. China developed the Spratly island as part of its plan to increase its legitimacy claims over the South China Sea territory. This island was turned into a military outpost which caused political tension in the region, in addition to raising international environmental concern due to the excessive dredging activity in the area. There is no guarantee that this problem stops here. Other countries can equally develop man-made islands according to their country’s agenda. The potential for political disputes may cause war to break out between the involving countries. This is ethically impermissible and is against the Utilitarian approach as the possibilities for harms topples the amount of good that can come out of it. Due to rise in coastal realty development globally, for example, Dubai, the law of supply and demand dictates that the coastal estates’ prices will rise. This created political pressure to increase or produce more coastal areas. The situation now turns into a race to shore up as many lands as possible while natural islands and coasts disappear. It can be concluded that the real meaning behind developing artificial islands has shifted from pragmatic utilitarianism to something that is only used to serve one’s interest. The construction of artificial islands comes at a great cost to nature. The construction of islands will cause shoreline erosion in the long run. For instance, in the Palm Jumeirah, the island disturbs the sediment movement due to the transformation of waves as they reach the edges of the island. This deprives the neighbouring beaches of sediment and results in the erosion of the shores. In addition to this, the construction of artificial islands would not only increase wave height but also change the direction of the wave. This sudden change to the water flow shifts the sediment motion, contributing to erosion. Another impact of constructing islands would be endangering aquatic life. For instance, the construction of palm in Dubai would not only bury a total of 3.5 million square meters of aquatic corals but also endanger fish species and their habitat, disturbing the ecosystem complexity and diversity. Furthermore, the safety of artificial islands is argued as rapid erosion destroy island components, as seen in Hong Kong-Zhuhai-Macau-bridge. Discussing the previous points, it would be regarded unethical to construct islands as they disregard ethical theories. Constructing islands will not produce the greatest good and least bad as suggested by the Utilitarian approach. Instead, it negatively affects the water life and causes worse than good. It would threaten occupier’s threats, which increases the bad harm that can happen to them. Based on the points discussed above, we firmly believe that the negative impact outweighs the potential benefit in continuing the construction of the artificial island. Further developments on any artificial islands should be put to a stop. Very interesting read. Good organization of ideas. Very well written. Portrays elaboration through discussion of various points and ideas. The article was well discussed and showed both arguments from an ethical point of view. Good articlr to read! Points and ideas are very well elaborated. Very interesting reading. Article showed both points from ethical point of view, should have elaborated more on the against argument point of view. The article was well discussed and showed both arguments from an ethical point of view. Very well written article. Smooth transition between topics. Well written, discussed and organised. Very interesting. Good writing and well constructed discussion. It was interesting to read the controversial impacts on the ecosystem and as well as the benefits of using artifical foundations to associate new habitats. The article is well written, both points of view well written and discussed. The risks posed by building an artificial island are serious. This article manages to shine a light on an important issue. Recent decisions to build islands should be put to question. A very interesting topic, written with great perspective and rich language. Worth a read! A great article with broader perspectives on how artificial islands can benefits and also harm the nature. As reader, I do understand completely the messages that writer conveyed. Well written and very informative. Writer managed to give solid reasons on why the development of artificial island should be avoided at all cost and I’m totally agreed with that. Interesting insights regarding the pros and cons of artificial islands construction in relation to social, politics and economy aspects. The article was straight forward and provided ample proof to support its main ideas. Clearly, the construction of artificial islands causes more damage rather than bringing profit to the community. More light should be shed to the public regarding this particular subject to prevent any further unnecessary advances towards artificial islands construction. Well elaboration on the points and a good read for people with limited perspective like me. Points are very straightforward without causing any confusion. A well-written article and good discussion between both the pros and cons of artificial islands. Artificial islands are important technology humanity can utilise in the current state of the rising world population where free lands for development becoming scarcer. However, the construction of an artificial island also needs to benefit nature from its planning to its completed construction. Having soil erosions to natural coastal areas and disrupting natural fauna in the sea where the island is built is are not ethical in my opinion. What do you think about this? How can engineers make the best decision balancing these things? Another thing is about the artificial island for oil drilling. I completely agree with your point on increasing energy consumption in the future, but, after the reservoir is depleted, what would happen to the island? Will it be deserted, destroyed or used for another purpose? Interesting article and well thought out arguments for both positive and negative sides of artificial islands. I think at the end of it all, an artificial island is a tool that can be used for both good and bad. Just like how everything else in this world does. Like how power plants bring so much good to the world population as it brings energy, it also brings large negative implications for the environment. I believe that artificial islands has a lot of potential to be beneficial, such as using it to generate electricity and energy. Also, if we look at Singapore and its increasing population, artificial islands can help the country to address the issue of insufficient land for its population size. I think stricter regulations such as limiting to what extent an artificial islands can be constructed and allowing it only for reasons that will be beneficial to the surrounding environment and community can somehow reduce the negative effects your article has highlighted. An interesting article, have you considered the support for both For and Against using the other three ethical theories too? Are they valid in this case? Without a doubt, artificial islands have their own merits as well as consequences. However, I do not agree with the statement where further developments on any artificial islands should be put to a stop. This man-made construction would be able to solve serious issues such as the lack of land to sustain increasing population. Furthermore, more land means more opportunities, more employment and overall improvement for the people and the countries economy. Stricter regulations as well as more scientific research needs to be done to minimise the negative effects of constructing artificial islands.